The idea, introduced by the Labour Party, of putting VAT on private school fees to fund free school meals for all state primary school pupils ticks so many boxes. Nutrition is so vital at a young age. Providing a universal (not means-tested) benefit has been shown to solidify support (and therefore funding) for the welfare state. The tax rise would raise £1.5bn to pay for a policy that would cost £900 million, so it is a fully funded commitment (in theory).Meanwhile, the redistributive aspect (or ‘class-war aspect if you like to view things that way) of specifically targeting something only those on high incomes can afford makes many people, well, feel good. I don’t intend to dismiss the idea, nor blindly support it. I just want to raise a few questions to show how the costs and benefits are not as clear cut as one may think. But first, some attempt at full disclosure. I need to do this because in my reading around this attempts to provide balanced arguments are drowned out by attacks on the messenger rather than on the substance of the arguments. When I write about policy I try to do so from behind the ‘veil of ignorance’. This is a concept introduced in John Rawls’ “Theory of Justice” that suggests that when we are deprived of all knowledge of our personal and social circumstances (i.e. we don’t know if we will be rich or poor, disabled or not-disabled, black or white), we opt for political and economic arrangements that work to the greatest benefit of the less well-off. The welfare state is a form of collective insurance against life’s hazards, from ill-health, unemployment and the death of a partner to disability and the ravages of old age. At the moment, I am well aware that I don’t need it, so a rational decision might be to not worry about what it does. But I try to write imagining that I could need it. Yet, I have already had, when introducing arguments around this topic, the comment that I was “speaking like a true private school teacher.” Ok, so I teach at a private school. One of my children is at a private school, the other joins in September, so yes, this will add to my financial commitments. You can stop reading now if you want. Or, you could also note that both of my children spent four years at their local state primary and I have been a Governor of that school for two years. Maybe you would find it useful to know my first four years in teaching were at a state comprehensive in North West London. I have seen the importance of free school meals, indeed I have been a beneficiary of them for a few years. But I have also seen just how important breakfast is (and this isn’t mentioned in Labour’s policy), and the negative impact of providing universal free school meals on the ‘pupil premium’ (a pot of money that follows the children of low income families into schools to support their academic and pastoral development). Put it this way, the policy may seem superficially advantageous to society, but the devil is in the implementation and how its consequences are handled. The concept of universal benefits is controversial in itself. Some will argue that benefits should only be available to those who need them, on a means-tested basis, pointing out that we shouldn’t be giving tax payers money to people to whom the cost of school meals is a relatively tiny dot compared to the cost of their house, second home and twice yearly holidays, all of which they can afford much more easily as they don’t have to pay for their child’s education as they are in a state school. It is the same argument used to introduce means-testing on child benefit a few years’ ago. Should taxpayers money be used to give middle class parents money for macchiatos or ballet lessons for Clarissa? The problems is that if benefits are only paid to means-tested recipients, and are never universal, the welfare state as a whole loses widespread support. Numerous studies have shown that countries with some universal benefits paid tend to have better funding and support for their welfare services and systems, as if everyone benefits even a little bit, support, and therefore funding is pushed up. When I worked in a state school, a far bigger nutritional problem was that many low income pupils were not eating breakfast. This meant they had extremely low energy until lunch, affecting their morning lessons. Some of them would have a pound left on the mantelpiece next to the door for them to take to buy ‘breakfast’, which they would spend on a packet of custard creams and a Rubicon Mango. The influx of processed sugar would cause behavioural problems for the first few lessons, at which point the sugar would wear off and they would want to fall asleep until lunch. If Labour want to fund free school lunches, they should fund it properly and fund free school breakfasts as well. 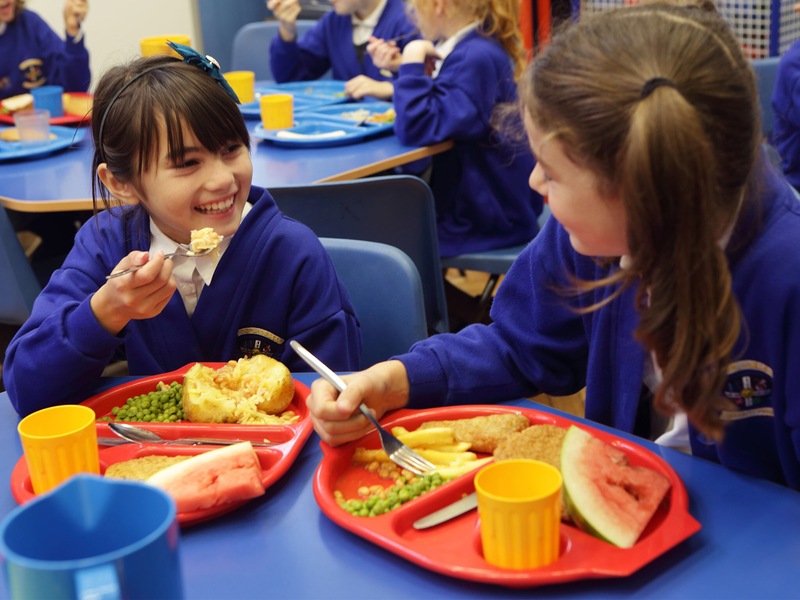 Do the benefits of free school meals outweigh the costs? You would think this is an easy question. Apart from the money what could possibly be the ‘cost’ of a free school meal? Well, may I introduce you to the ‘pupil premium’, and amount of money given to schools to accompany any low income pupil in order to support their literacy and numeracy as well as their behavioural, social and emotional development. Schools get the money and have to account for its use, and monitor its effectiveness. Schools get the money, which is about £2000 a year, when the pupil is identified as coming from a low income family. This was made simpler when families had to apply for free school meals. When free school meals were made Universal in Key stage 1 (up to age 7) a few years’ ago, schools lost that easier ability to identify those in need. They had to rely on parents identifying themselves as low income. But there was little benefit for them to do so, as pupil premium money was put into a pot, not necessarily spent on their child in particular. So a lot of schools lost that funding. The Primary School of which I am governor had pupil premium funding for 66 pupils one year, then 31 the next year. That is around £70,000 lost to school funds that would be spent helping the least fortunate in society. If universal free school meals for everyone means that schools lose that ability to identify pupils most in need of support, that is a massive cost. I would like to ask Labour what their answer to this problem is. Under what circumstances might the sums not add up? As I said above, the policy would cost about £900m a year but would be funded by £1.5bn from putting VAT on private school fees. The Labour manifesto contains a tax on private school fees and a tax on private health premiums which, I imagine, are aimed at reducing demand for private provision of education and health. I assume they don’t think that demand would raise the same, making these fees and premiums a static fund they can raid? Not every private school fee payer is a multimillionaire, to whom fees might be drops in the ocean. Some are working all the hours they can, every day to pay these fees, making sacrifices for their child’s education. Effectively raising fees by 20% will put them out of reach for a group of them. Predicting how many is difficult, so I will make it easy and assume 20% of private school kids will be put back into state education. That reduces income from this tax to £1.2 billion and put the costs of the policy up to well over a billion , and suddenly this policy looks less affordable. By costs going up I mean the cost of not just providing the free school meals in primary schools but the cost of educating pupils, which is about £6,000 a year for each child who drops out of private school and whose parents thus stop paying twice for their education (remember, every pupil in private school has parents who pay the same tax and are effectively paying for the state school education they aren’t receiving at the same time). Many of Labour’s policies rely on no change to behaviour…and that is simply unrealistic. Why hasn’t anyone thought of putting VAT on private school fees before? Anyway, VAT cannot be charged on private education until Brexit is completed. That doesn’t make it not possible, in fact you could argue that this is a forward-looking policy from Labour that envisions the world they want to create after Brexit. It will be no surprise to anyone that the world the current Labour leadership want to create is one dominated by the public sector, which is what this policy could encourage. No, because Labour won’t win. But as I mentioned in a recent blog, Jeremy Corbyn’s leadership has opened up discussion of policies that haven’t been discussed before, and this particular one is multi-layered, as I hope I have explained. It ticks many boxes too, but a predictable outcome isn’t one of them.